[This] is a photo my wife Roberta took of us cruising across Nomini Bay on the lower Potomac leaving Shark Tooth Island and heading back to our summer place on the Lower Machodoc Creek [earlier this summer]. It took a few shots to get the boat waves to align with the sunset and clouds. 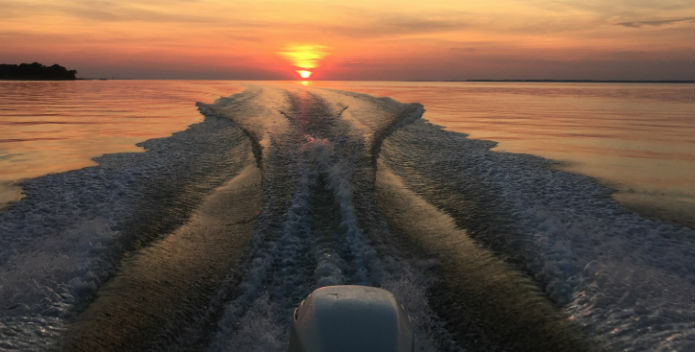 We spend a great deal of time on the Lower Potomac and Bay around Point Lookout, fishing, crabbing, and pleasure cruising. Roberta always comments that we have a really nice back yard! Ensure that Greg, Roberta, and future generations continue to enjoy extraordinary places like these along the Chesapeake. Support the Chesapeake Clean Water Blueprint�the plan to Save the Bay!